5. What is your favourite kind of seafood? Hmmmm…. can I say both. I enjoy all the planning that goes into having a party - the food, decorations, music, etc but I also love being the guest. I’m very glad this wasn’t asking how many handbags!! Purses - just the one. Yes, that’s right one. Time to link up and meet!! This is a blog hop so if you want to put the linky on your post just click the "Get the Code" at the bottom of the linky. 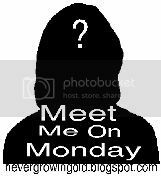 Your link MUST include your Meet Me On Monday post or it will be deleted! Remember if you don't have a blog or if you just want to post your answers in the comment section then that is fine too!